flowers? And, how do bees find these flowers? What benefits, if any, do the plants derive from the beesï¿½ visits? between plants and insects. Whole books have been written especially about bees amongst the insects associated with plants. (bat pollination); phalaenophily (moth pollination). In a subsequent article I will describe the complexities of pollination and pollinators amongst the various species of Pelargonium. But for now I will look at bees (especially honey bees which have been the most intensively studied insect) and their vision. of receptor responds to different wavelengths of light. 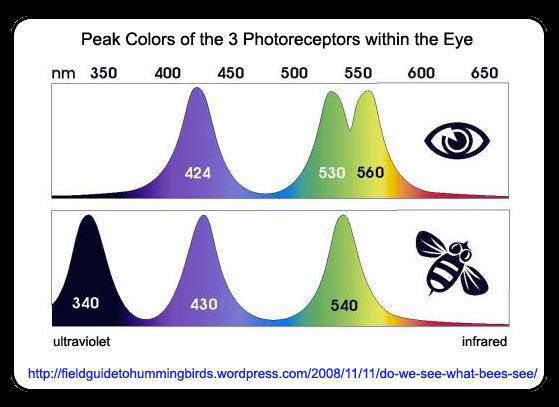 In humans, our cone cells respond to red, green and blue wavelengths of light.